The Sweetener Company is based in Derbyshire in the UK. Derby itself (A on the map opposite) was home to the industrial revolution and is also the home of Rolls Royce Aerospace; Engineering and manufacturing skills and training are found to a very high degree in the local workforce. 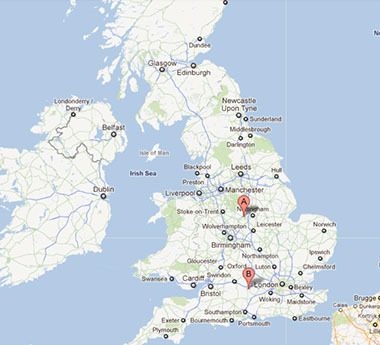 The Sweetener Company also has a head office located in Sherborne St. John, Hampshire (B on the map opposite). Derby is the UK's most central city and access by any mode of transport couldn't be simpler. By road - centrally based Derby is accessible using the A6, A50, A38 and A52. Derby is 15 minutes from M1 junction 24 or 25. Well sign-posted car parks are around the city including plenty of parking for the disabled. National Express operate regular bus services to Derby. By rail - excellent national rail services are available, just 1 hour 40 minutes from London. Call the National Rail Enquiry Line for full timetable details - +44 (0) 8457 484950. Derby Airline Shuttle - Visitors travelling to and from East Midlands Airport and Derby, can take the high quality and direct Airline Shuttle bus, which provides links with Derby city centre and the Railway Station. This is a 21 hour service operating every 30 minutes between 7am and 7pm and hourly at all other times, getting you where you need to be in 35 minutes. Sherborne St. John in Hampshire is conveniently situated in the centre of Southern England, just minutes from the M3 and easily accessible from the M4 as well. Basingstoke has direct connections to London Paddington and the West. Basingstoke is within a one hour drive of Heathrow and Southampton airports.